This simple Cherry Chia Lemonade is refreshing, easy, quick, and fun to make over the summer. All it requires is 4 simple ingredients and a blender. Soak 2-3 tbsp of chia seeds in 1 cup of water for at least 4 hours, mixing once or twice in between. If you love chia seeds just as much as I do, use the full 3 tbsp! Once the chia seeds have soaked up in water and become gelatinous, remove them from the fridge. 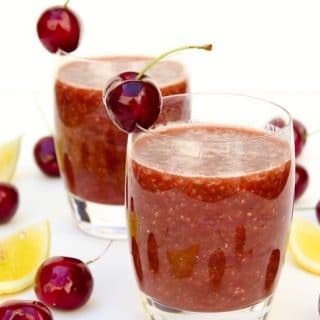 Add the fresh pitted sweet red cherries, 1 cup water, and 1 tbsp freshly squeezed lemon juice into a blender (I used my Vitamix, but any blender should work just fine). Blend completely until everything is pureed into a smooth liquid (i.e. no chunks of cherries should be left). At this point, taste the contents of the blender and add some more lemon juice and/or agave nectar (maple syrup) for added sweetness if you prefer. I did not need to add any since my cherries were really sweet. Quickly blend once more if needed. Pour the contents of the blender out into a jug. Add all the contents of the soaked chia seeds and some ice cubes. Mix and serve cold! For other variations, use any fruit in season. For best results, keep chilled or pour over ice.